You may have noticed a reduced amount of sugary treats & and the addition of nutritional information on my posts lately and if you guessed that I’ve started trying to eat healthier, you guessed right! My 10th wedding anniversary is coming up in June and my 30th birthday in October and I refuse to look the way I do right now for either of those occasions! (Somewhere between Krispy Kreme Bacon Cheeseburgers, Rolo Pretzel Turtles, and Buttery Beer Bread, I managed to gain 25 pounds. I’m mystified! ;) ) Luckily I find it much easier to eat healthy in the summer than I do in the winter, when we naturally tend to eat heavier foods, and I haven’t felt deprived at all (yet) eating wonderful things like this Five Bean Salad. It is a very simple salad to throw together and has a wonderful sweet & tangy dressing that soaks into everything and does a little dance in your mouth with each bite. The best part for me is that the longer it sits in the refrigerator, the yummier it gets. The recipe makes quite a lot for two people, so we can enjoy it over the course of three days (spaced apart over a week) without worrying about it getting mushy or funky. Dennis and I both like to pack it as a lunch because although it’s usually served as a side dish, we both love it so much that we can’t keep to one small serving and prefer to make it into a meal. I’ve been making it for several years and although I don’t remember where I got the idea, I do remember that the original dressing I used made so much that the salad would be sitting in an inch of it. I’ve now got the dressing under control so that it’s just enough to coat everything with just a little bit in the bottom for you to stir back into the salad before serving. I have also tried adding other beans, at one point making it a 7 Bean Salad with black-eyed peas and black beans, and have added cilantro, parsley and even green pepper and while I like this salad best the way I’ve written it here, it can obviously be changed up to suit your tastes. Mix dressing ingredients in a small bowl and set aside. Combine all salad ingredients in a large bowl, pour the dressing over and mix well. Cover and refrigerate overnight & stir well before serving. Makes 6 main dish servings or 12 side dish servings. Posted in Lighter Fare, Salads, Side Dishes, Vegetarian & Vegan and tagged 5 bean salad, five bean salad. Bookmark the permalink. lol, yeah, I wonder where that 25 lbs came from…hmm…at least you know you enjoyed each and every lb you gained! lol. But best of luck regaining your figure back! Healthy diet need not be painful. Just like you proved with that delicious 5-bean salad! Hey there- I may as well join you in this dietary pursuit. I too packed on the pounds this winter (and enjoyed every one of them). I figure if I lose 20 or 25 of them by this fall I can start right over. The salad looks great and is perfect for this time of year when we maximize our outdoor time. Thanks Veronica! 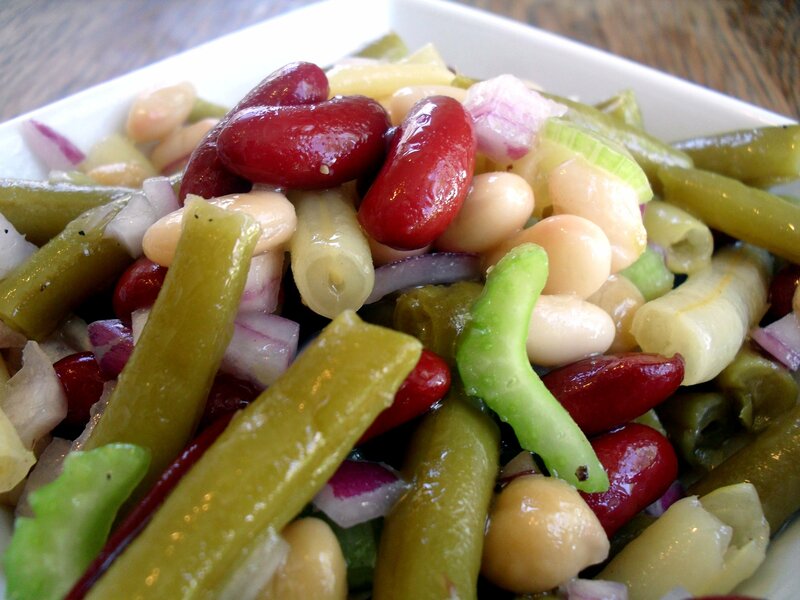 this 5 bean salad certainly looks healthy and delicious! A great light meal! Good luck in your healthy endeavors! ;) I’m sure you’ll look gorgeous for both occasions. My mom LOVES 5 bean salad and I don’t think she has a recipe yet — I’m printing this out for her! This looks great and so easy to put together! I have never seen one as delishious looking as this. My usual response is “the cringe” because of so many attempts at trying premade bean salad st the store. I actually want to dig right in! By the way, check my blog~ you have awards waiting.. I crave this salad. Now I don’t have to go to costco to get it. Thanks for posting the recipe!! If I were to use fresh green beans would I cook them first and then add? Yes, definitely – cook them to the texture you would enjoy in a salad.